The last couple of weeks have been busy, but, that does not mean I have not been wandering around finding things to cook. Well, in most cases it really is not that much of a choice, as a family we need to eat, and so there is always kitchen action going on, and midst this kitchen action I discovered the chioggia beet. Now, the chiogga beet (pronounced kee-OH-gee-uh) is a pretty Northern Italian beet, that is actually striped when sliced. I discovered this beet during my meanderings at the Hilltop Hanover Farm, and in this salad, I have roasted the beets. All of that roasting actually fused the colors and got me these pretty pink beets that actually do not streak everything we are working with, resulting in a very pretty pink salad. 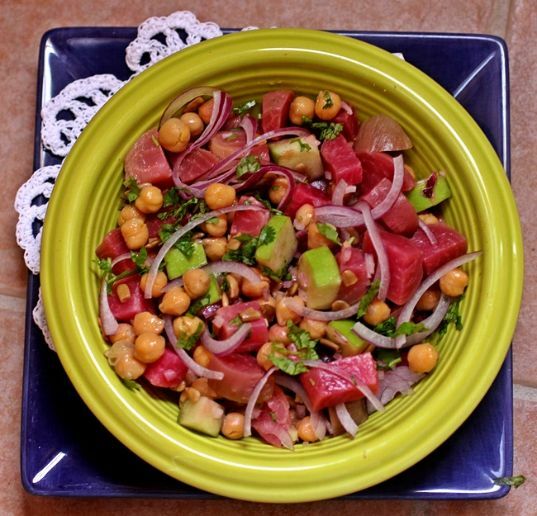 I paired this with some chickpea, and chopped green apples. I think I will actually vary the beans next time round to add more color to the mix. Every loved the salad, and I combined some as a wrap for lunch as well. 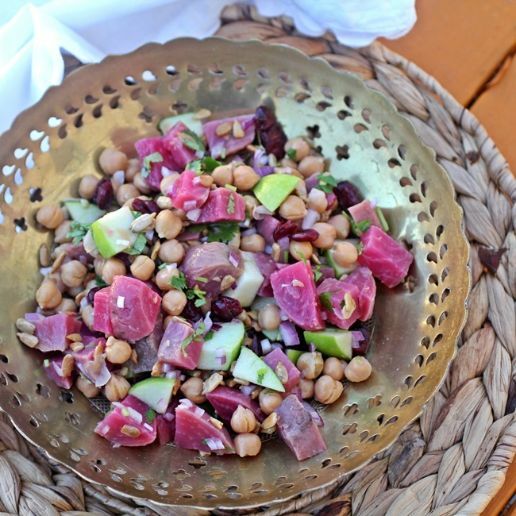 A lovely fall salad made with chioggia beets, granny smith apples and chickpeas. 1. Heat the oven to 350 degrees, wrap the beets in foil and place in a baking dish and bake for about 40 minutes. 2. Cool, peel and cube the beets. 3. Place in a mixing bowl. 4. Cube the apples, removing the core and the seeds, it is not necessary to peel the apples. 5. 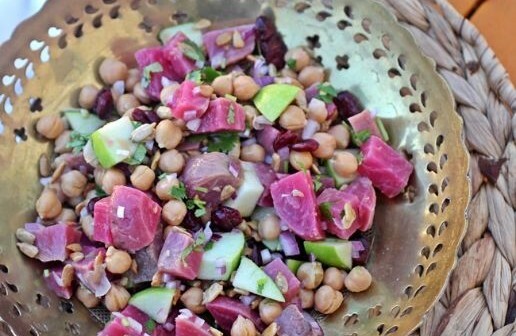 Add in the cranberries, chickpeas, red onions (if using) and sunflower seeds. 6. Stir in the fresh lime juice, red cayenne pepper and black salt. Sprinkle with the cilantro and serve.